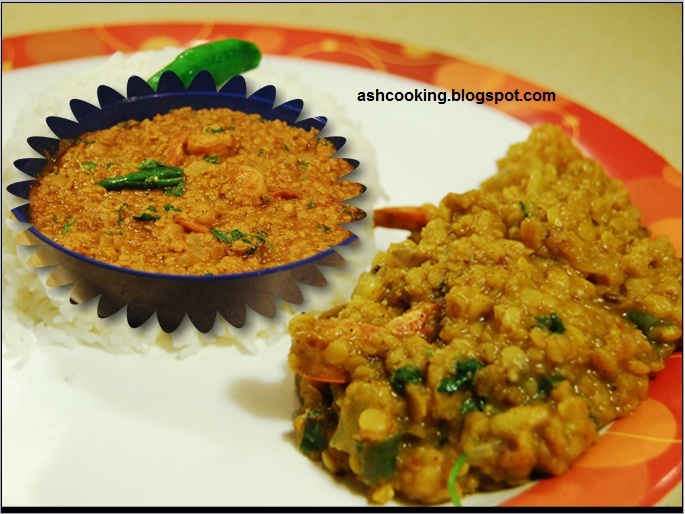 Red lentil in Bengali is called 'masoor dal' and 'chingri' means prawns. Dum means slow-cooking or cooking something covered on low or medium heat so that the ingredients get cooked in the steam built inside. This account explains the name "Masoor Chingrir Dum" for people not familiar with Bengali language. Also, it sets an undertone for the dish going to be detailed and discussed below. As the name implicates, masoor is given 'dum' through slow-cooking with prawns laid side by side. 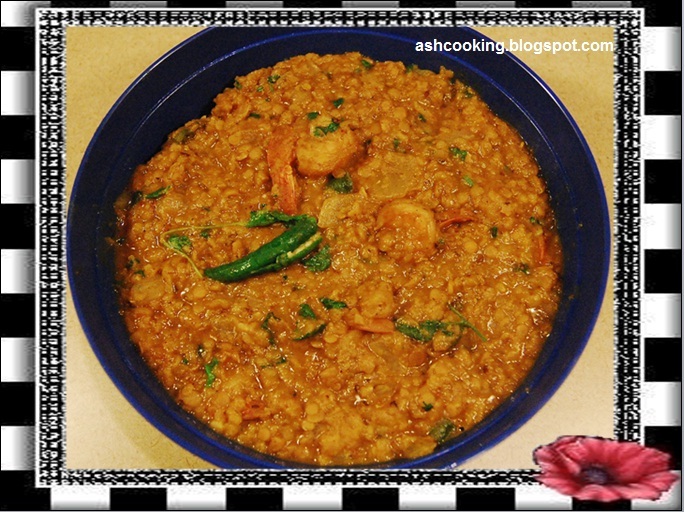 The spices incorporated in uniform measure give birth to an innovative dal concoction. The aroma of whole spices and the final taste booster called 'ghee' makes it a heavenly experience for those privileged to consume it. I have adapted the recipe from a cookery program. But as I said 'adapted', the original dish was cooked with a hint of sweetness with sugar and raisins. I parted with the raisins part and adapted it according to what my family would like and 'loved' they indeed as my husband has given his verdict with 'it is one of the best dishes' I cooked out of the 170 something recipes posted in my blog. 1) Soak the red lentil for 4-5 hours. Drain the water and then keep aside. 2) Heat oil in a pan and when oil turns smoking hot, add the ingredients for sauté and allow them to sputter. 3) Add the prawns and shallow fry them till they take a golden hue. Toss in the onion and chopped green chilies. Stir around and let the onions become translucent in color. 4) About this time, add cumin powder, turmeric powder and red chili powder. Mix in. 6) Finally, when dal seems tender, sprinkle garam masala powder on top and fold in ghee. Stir around. 7) Garnish with split green chilies and coriander leaves. Serve hot with rice or roti.